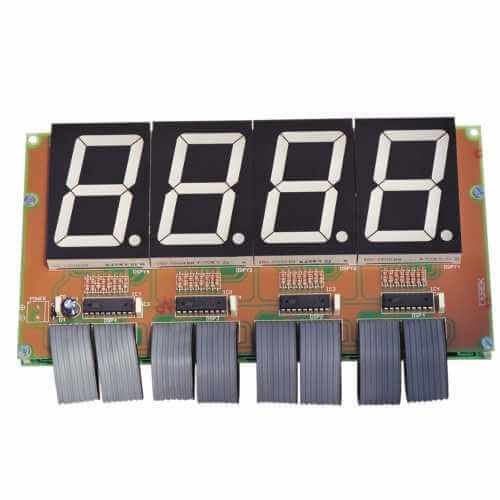 The Cebek CD-22 module is a large digital LED clock and thermometer display module with 58mm high digits. The 4-digit display can be set to show the Clock only, the Thermometer only or both (with the display cycling between the two). The cycling rate can be adjusted between 1 and 18 seconds. The Clock function displays Hours and Minutes in a 24 Hour format. The circuit uses a Quartz oscillator to provide a high degree of accuracy. The Thermometer can be set to display degrees Celsius or Fahrenheit. The measurement range is -23 to 105°C.